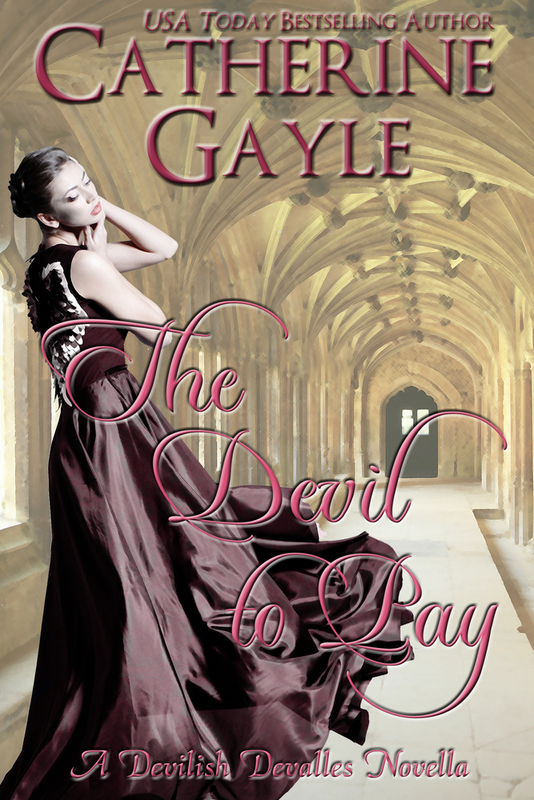 Over the years, Gabriel Devalle has more than earned his reputation as one of “those devilish Devalles.” No one is more surprised than Gabe, therefore, when a debutante tosses herself into his path, only to have her gown “accidentally” ripped by her mischievous and alluring sister, all in the name of causing a scandal. Or was it to prevent a scandal? Either way, the gown-ripping sister has certainly drawn his notice. Miss Miranda Hunt will do anything to prevent her sister from making a mistake which would bring scandal down upon their family…even make a deal with the devil. Mr. Devalle is no angel—fallen or otherwise—but he is devilishly handsome, shamelessly wicked, and as infamous a gentleman as Miranda has ever known. He promises to circumvent her sister’s schemes…for a price. What is a proper young lady to do when she has The Devil to Pay? Samantha’s fan then whipped into action, creating a breeze around the two of them far stronger than any air coming through the open windows and doorways. It had been an uncharacteristically hot day in London considering it was only May, and the evening was proving to follow the same pattern as the rest of the day had done. Between the crush of bodies crowding Lord Leicester’s ballroom, the hundreds (if not thousands) of candles lighting the area, and the lively country dance being executed by a few more couples than could reasonably fit on the dance floor, the air was stifling. It was a wonder any of them could breathe at all. “Is it illegal now to not rescue someone?” Miranda whispered, straining for comprehension. She’d never heard of the like in all her twenty years and doubted she ever would again. Heavens! Miranda had had no idea. If there was one thing Papa would always insist upon with his two youngest daughters, it was that they never consort with anyone scandalous or unsavory. Although, consort was probably not the best choice of words to use. Associate might be a better choice. Still, scandal must never be associated with the Hunt family or the Calstock Viscountcy. “We must be certain not to ever be seen with Mr. Devalle, then,” Miranda said decisively with a brisk nod of her head. The seriousness of her tone actually surprised her. Striving to meet Papa’s expectations had always been important to her, of course, but there was something grander behind her reaction. Something more personal to her and not simply related to Papa and his wishes. She’d heard enough gossip tossed around in enough ballrooms in her two previous Seasons to know she never wanted any of it to be associated with her. Not for any reason. The very thought of it sent goose flesh racing down her spine. Miranda, for one, had no intention of ever meeting this apparently lecherous man, or anyone at all from the Devalle family. The risk to her reputation was not worth any slight thrill she might experience over meeting someone of such infamy. That reaction was the furthest thing Miranda would have expected from her sister, so unexpected that she turned to make certain she hadn’t been mistaken. Sure enough, Samantha’s lips were turned down into a frown as she scanned the ballroom with an intensity Miranda had rarely seen from her sister. Goodness! Did Samantha want to be embroiled in scandal? But why? “You don’t agree?” Miranda asked when her tongue would once again cooperate. Oh, how she hated the fact that so often, if she felt flummoxed by something or someone, she lost the ability to speak coherently at least for a time. It was bothersome to the extreme. “Oh,” was all Miranda could say. She’d known there’d been a spot of trouble with investments and whatnot, but she honestly hadn’t paid any of that much attention. That was between Papa and Jason, and not really anything she’d thought was any true concern. Not for her at least. It was all just too much to take in at once. She shook her head. “You’re just overreacting because you’ve spent more Seasons on the marriage mart than you would have liked.” Samantha was three-and-twenty, after all. They’d all hoped she would have made a match well before now. Samantha knew very well just how much loyalty Miranda had, so that comment stung. There was nothing she wouldn’t do for one of her siblings, for her parents. She might be the youngest of the family, but not once had she ever failed to come to the aid of her family when needed. She was on the verge of pouting because of Samantha’s jab when her sister took a few steps out of their alcove toward the main ballroom. Good heavens! Had she been serious about seeking out a scandal? To think she’d had the audacity to accuse Miranda of familial disloyalty. Miranda reached out a hand, placed it on her elbow, and stopped her. “What do you intend to do?” She hated that her voice was quivering. To cause one? Oh, goodness. Samantha started walking again, forcing Miranda to tighten her grip. She really meant to do it. Although, what it was, Miranda still hadn’t the tiniest inkling. Then with a twirl that sent the peach muslin of her gown swirling about her legs, she disappeared into the throng. Miranda muttered an oath beneath her breath before delving into the crowd behind her sister. She was the youngest of the Hunt siblings, for heaven’s sake. She wasn’t supposed to be the one rescuing her elder siblings from their folly. Yet she supposed she must.